I was sitting at Mom’s bedside in the hospital as the news of Tullian Tchividjian’s resignation began to hit the news. Heartbroken, I was trying to find the words to make sense of everything when I stumbled upon a piece from mom’s old writings. I’m so thankful for this classic parcel of wisdom she penned years ago. It seems she could have sat down and written it just today after looking at the newsfeed…that’s when you know Mom’s wisdom is transcendent. May her words speak and powerfully minister to you as they have to me today. Swirling about us today in unprecedented number are revelations of indiscretion, immorality, and misrepresentations of truth. Unfortunately, these sins are not only prevalent in the highest echelons of government and business, but in the church world as well. Blasted into our homes by the media and preached about from the pulpits across our land, these disclosures leave us bewildered and saddened. All too often, reaction to upheaval causes a drawing up of sides, a polarity of views. In politics, partisan lines of conservatism and liberalism are quite clearly defined. But in the religious world, the pendulum of faith swings from one extreme to the other. What should the stance of the church be in such a predicament? Tucked away in the Psalms are two words that, if applied, would answer this question and bring healing and balm both to the church and the errant one. The coupling of these two words, directly or indirectly, is seen scores of times in the Scripture. This was Nehemiah’s reaction upon hearing of the broken-down walls and burned gates in Jerusalem: to “sit down, weep, and mourn”. Although the palace was many days’ journey from Jerusalem, his first concern was what was happening in that city. When he made his petition to God on behalf of the children of Israel, he included himself. “Both I and my father’s house have sinned. We have dealt very corruptly against thee, and have not kept the commandment” Nehemiah 1:7. For Nehemiah, this time of reproach was also a time of self-examination. So it should be with us. The Scripture tells us: “All we like sheep have gone astray: we have turned every one to his own way” Isaiah 53:6. Our “own way” may not include the sins of adultery and fornication, but Galatians 5 states hatred, wrath, and strife will also prohibit entrance into the kingdom of God. So let us not adopt an unmerciful, “holier than thou” attitude, but implore God for personal cleansing daily and keep a right spirit in our own hearts. The only path to freedom and deliverance for the wrongdoer is to repent, confess his sin, and turn to God. Without godly confession and true admission of guilt, we short-circuit God’s power in our lives to be all He wants us to be. But do we in the body of Christ create a climate for the transgressor to be truthful? Too often, the transgressor finds himself drowning in a quagmire of criticism, unforgiveness, and rejection. Galatians 6:1 states that we are to gently restore the one who is taken in a fault. The very nature of sin is death, so the sinner has already wounded himself. It is the job of the church to restore this fragile one—and to do so gently. To rehabilitate means “to bring back to the original state.” This cannot be done if the wrongdoer is isolated, ignored, or ridiculed. How do we respond when an errant brother confesses a fault? Frequently, I fear, the story is immediately carried to someone else, who then calls a third party: “I just had to share this with you so you could pray with me about Brother so-and-so. Isn’t it just terrible?” Then the sordid details are spread around, and the poor sinner is banished from the body, resolving never to bare his soul again. The scriptural pattern would be for the first brother to pray with the transgressor until he repented and was restored, without disclosing the problem to anyone else. Years ago my dad, an old-time Pentecostal preacher, discovered a pastor from a neighboring town was having an affair. Dad went directly to this brother and confronted him with his sin. He confessed, repenting with tears. Then, at my father’s suggestion, he and his family moved out of the state. This man was later restored to an even greater ministry. My dad’s merciful confrontation brought him to a place of truthful confession and repentance. Of course, if this brother had refused to confess his sin when confronted, and persisted in his sin, then my father’s obligation to restore would have been finished. For 1 Corinthians 5:11 tells us not to associate with a brother who chooses a life of immoral activity. But this isolation treatment is to be used only after every effort to restore has been exhausted. Didn’t Jesus say to forgive seventy times seven? Nehemiah didn’t just sit around weeping and bemoaning the fate of Israel. He set about to rebuild the walls, and succeeded in this formidable task. Israel went “from reproach to rejoicing” in 52 days! It’s amazing what God can do with one person whose heart is broken before Him, and who has the courage and vision to follow God’s command. There are practical things we can do in a ministry of restoration. Call the hurting Christian. Be a friend. Send a card or letter. Has a ministry been lost? Has the family’s source of income been cut off? Is there a wounded spouse? What can you do to help in the time of need? Make yourself available. Let the hurting ones know you are praying. If possible, include them in a small prayer group. Above all, pray, pray, pray, and don’t give up. This is a spiritual battle that must be fought on our knees. 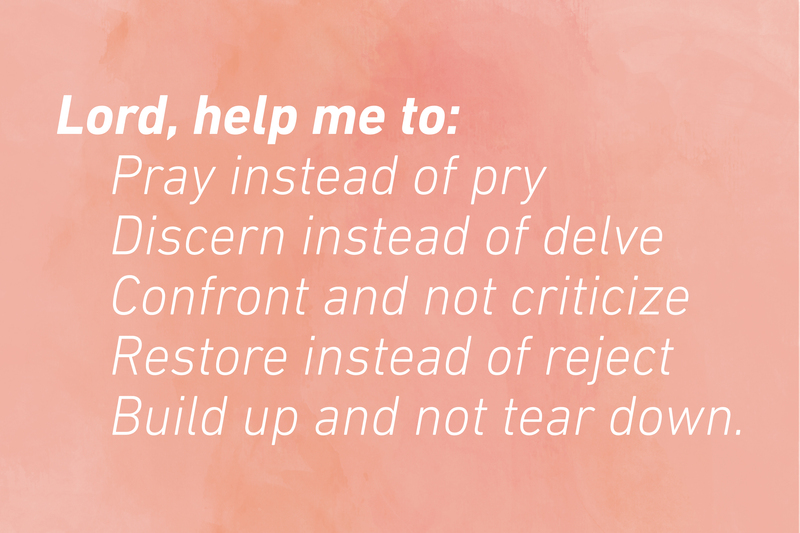 Will you join me in this prayer? When MERCY and TRUTH are met together . . .
Then righteousness and peace will kiss each other. HERITAGE (Summer, 1987), In Europe with Donald Gee, 1939, pp. 13-14, copyright by the Assembles of God, 1987. Ross Foley, You Can Win Over Weariness, pp. 127-128, Glendale, CA, Regal Books, 1977.